This is a curious debate. Many in academia use management as the title for business leadership programs. For example, a well-known large university in my town offers a degree in management in the business school and allows for a minor in leadership, which is under the college of life sciences and agriculture. Fortunately, the professor leading that program understands leadership and knows how to apply it in a practical way. I don’t feel that a degree in management qualifies a person to lead an organization, a team, or a project. Its basis is in other areas. As Stephen Covey points out, we manage time and lead people…we manage money and lead people…we manage project implementation and lead people…we manage things and lead people. There is a distinct difference. Managing people fits an autocratic leadership style and not a transformational leadership style. It can be a form of overfunctioning. Top down leadership that is autocratic minimizes the synergy of the team. As you see, there is a significant difference in these two paradigms. Effective leadership requires healthy self-esteem, confidence, and constantly evolving skills. Greetings, it’s Hugh, as promised. Remembering that as William Wordsworth once said, “Life is divided into three terms: that which was, which is, and which will be. Let us learn from the past to profit by the present, and from the present, to live better in the future.” We profit. It’s not about the money. Profit is bringing value to everyone concerned. Remember you can find all of these podcasts and their transcripts when you go to hughballoupodcast.com. This is #18. We are talking today about stupid leadership traps. This is #2. The first one was about bad meetings, boring, unproductive meetings. Hope you were inspired to think differently about the rehearsal with your team, where we either rehearse and define a high-functioning culture or we teach people to under-function and then blame them for what we have taught them. 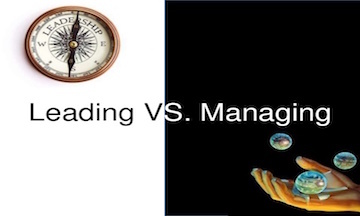 Today, we are contrasting the confusion between managing and leading. You manage things, and you lead people. That is a quote from Rear Admiral Grace Murray Hopper. Talk about leadership. How do you run companies? That is leadership. You manage things, and you lead people, as Covey said, as this rear admiral said, as many leaders have quoted. Fortunately, some of the professors leading some of the programs in leadership understand how to teach the students leadership and how to apply what they learned in school in a practical way. I don’t feel a degree in management qualifies a person to lead an organization, a team, a project, or is the basis for leadership competency in any area. As you may be aware, the Gallup Poll every year says that 70% of the corporate work force is either disengaged or actively disengaged. That costs American companies over $500 billion, this 70% that is not really functioning. What have we done as leaders? We have created that culture because we don’t lead. We don’t set good examples. We don’t understand what a musical conductor knows; that is, how to build an ensemble of excellence, how to build a high-functioning culture, how to create the synergy of the common vision. The vision belongs to the leader. The execution belongs to the team. Stephen Covey also writes about beginning with the end in mind. The transformational leader is able to define the quantifiable results. Here is our vision. Here are our specific accomplishments. Here are the goals we are going to achieve. Then they get out of the way. They understand that we lead people. We manage money, time, projects. We manage things. We lead people. There is a distinct difference in these. Let’s do a comparison between the leader and the manager. When you look at the page where this is transcribed, you will see a chart. On the left, it says “Topic.” On the right, there is a “Leader” column and a “Manager” column. The first topic is “Style.” The leader is transformational, and the manager is transactional. The topic is direction. The leader engages, and the manager demands. Conflict: Leader addresses conflict, and the manager avoids conflict. Risk: The leader takes risks and encourages risk-taking, and the manager avoids risks. Affirmations: The leader gives affirmations, and the manager takes affirmations. Concern: The leader helps others to be right. It’s more important that others be right than the leader be right. The manager must be right. Blame: The leader neutralizes blame, and the manager blames others. Energy: The leader is passionate, and the manager is controlling. Power: The leader leads by personal influence, and the manager uses authority. Focus: The leader focuses on leading, and the manager focuses on authority. The leader seeks consensus, and the manager mandates results. Decisions: The leader facilitates decisions, and the manager makes decisions. Culture: The leader is collaborative, and the manager is authoritative. In terms of activity, the leader delegates, and the manager micro-manages. Looking at the horizon, the leader works short-term within the long-term framework, and the manager only focuses on the short-term. Creating: The leader creates teams, and the manager builds puppets. Engagement: The leader creates followers, and the manager creates subordinates. Rules: The leader moves from a rules-based culture to a principles-based culture and uses principles for decision-making. The manager uses rules. Pathway: The leader creates pathways, and the manager uses what is already existing, such as systems. The manager utilizes systems, realizing the creativity is released if there is a system. The manager avoids systems. It’s their authority that moves them forward. Persona: The leader focuses on vision and values. It’s about the vision, not about them. The manager is autocratic. It’s about me. It’s a focus on self. As you see, there is a significant difference in these two paradigms. Effective leadership requires healthy self-esteem, confidence, and constantly working on and nurturing the evolving skillset. Are you a leader, or are you a manager? I hope this was helpful. Read the transcript at hughballoupodcast.com. I’ll see you on the next podcast: stupid leadership trap #3. Bet you can’t wait.